The 1Byone hd antenna has been on the market for a very long time and there have been plenty of satisfied customers using it. Do you happen to be looking for an HD antenna that is going to be able to provide you crystal clear picture? If so, you are likely going to want to check out the 1byone Amplified HDTV antenna. It is easily one of the best HD Antennas on the entire marketplace. Cutting the cord in today’s digital age just makes sense to save yourself money and take control of the TV shows you want to watch and save money from not having monthly cable bills. With that being said, cutting the cord can come with it’s own set of headaches. One of the most important pieces of the puzzle to get rid of your cable bills is having to choose a home dvr unit like the channel master dvr and getting access to an HD antenna. 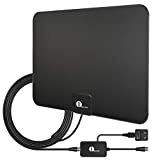 Below, we will be going over more about the 1byone Amplified HDTV antenna and we will be discussing whether or not it is the write antenna for you. Most of us will want to try out the indoor hd antenna style because it is easy to install and extremely affordable. There are other options to install in the attic of your house, on your roof or outside on stand but we’ll cover the indoor option in this article. The 1byone is a flat style hd antenna that you can a hang from the wall, back of your tv or just lay it behind the tv. It is a soft material that they made that is actually paintable so you can decorate it to help blend into where ever you put it. You can even hang this model on a window if your TV is by one which will actually help your signal strength. Included with it, is a 10 foot coax cable which you will use to connect to your tv or receiver to receive the hd signals in 1080p. With a 10 foot cable it should give you enough options to move the antenna around to give you the best signal and also keep it out of view. It does come with a 12 month warranty. So, if you are not satisfied with it you can send it back for a refund. The setup is extremely simple. You literally connect the coax cable to your HD Tv and use your built in tuner to scan for channels. Once it is finishing scanning you are up and running watching free HD TV! This is a best seller on amazon. Over 7,000 people have commented on this product after purchasing it. You can check it out on amazon here for more information. It’s very Lightweight – Because this antenna is lightweight, you are not going to have to worry about placing it on another electronic device or something that you might worry about if it was heavier. Fast and Easy To Set Up -Because this particular antenna is so fast and easy to set up, you will be able to connect it with ease in a matter of minutes. This is going to allow you to get started in using it as soon as possible. Multiple Position Set Up -Because this particular antenna comes with 2 sided mounting tape, you are going to be able to effectively move it freely in order to find the best possible location for the highest quality signals. You should be able to hang it on the wall, hide it behind your TV, stick it on a window, or even stand it on a shelf. Comes In 3 Different Ranges – Because this particular antenna can be purchased in various ranges including 25 miles, 35 miles, and 50 miles means that you are going to get the amount of range/power that you need to get the kind of channels you want. Clear Picture – One of the most frequent comments among customers is the fact that the HD antenna produces crystal clear pictures. A Lot Of Channels – Some customers noted they were even able to get up to 52 local channels. This particular antenna comes in a variety of ranges. Therefore, the amount of channels that you are able to get with your unit is going to vary depending on whether you opt for the 25, 35, or 50 mile version. Easy Installation – A lot of customers have also noted how easy the installation is for this particular antenna. If you are worried about having to deal with a confusing or difficult installation, there is no need to with this product. Bought Extra Amplifier – In the event that your signal is weak you can buy the extra amplifier kit for it. You would only need this if you have a very long cable run from where you hang the antenna going back to the TV or DVR. Overall, if you are looking for one of the best HD antennas on the market, this is going to be the one that you should opt for. The fact that this antenna comes in a variety of ranges makes it an incredible value. It means that you are not going to have to pay more for something that you will not be using. The fact is, it would be hard to find another HD antenna on the market that offers as much value as this one does for the amount of money that you are going to spend. You will be able to find the best deals on this particular antenna on Amazon here. Feel free to read the customer reviews and see for yourself why it is the #1 best seller in antennas.